I chuckled a bit when April Fool’s day dawned on an inch or two of fresh snow, making for a White Easter. I was less amused that Tuesday, when a blizzard dumped a good nine inches of snow on my 120-foot long driveway. But that was nothing compared to what was in store. 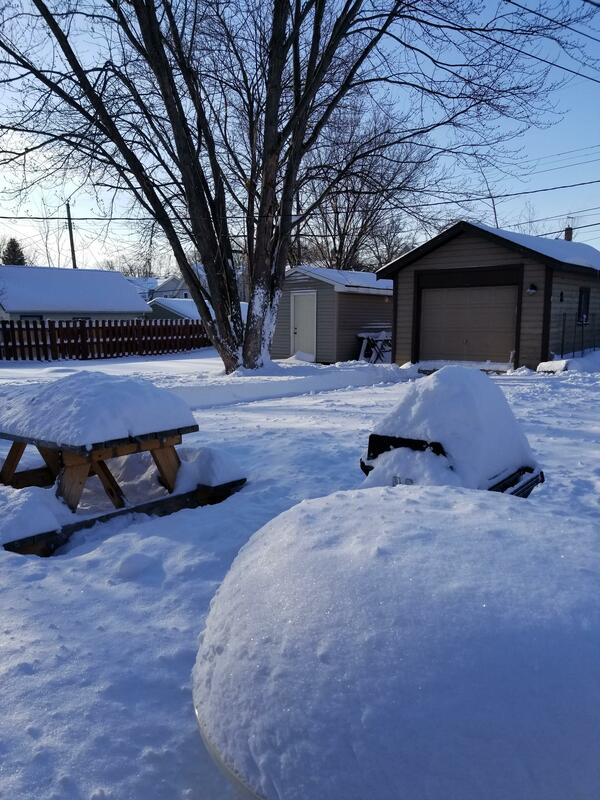 Whether because it was Friday the Thirteenth, the Ides of April, or just a supercharged storm amped up by climate change, howling winds spun nearly eighteen inches of snow across St. Paul between April 13thand 15th. Like its more tropical brethren, this April blizzard even had a name: Winter Storm Xanto. I try to stay open and watchful for moments of wonder, beauty, and delight while I am outdoors. As a way of deepening these experiences, I have a practice of crafting them into little prose-poems I call “moments in the park.” Encapsulating these moments in words allows me to look back and relive the beauty of earlier days. After struggling to dig out from this latest dump, I see that, months earlier, snow seemed delightful, even while shoveling. February 7: A thin layer of snow wrinkles ahead of my shovel like the skin of a shar-pei puppy. However, by the middle of April, that sense of delight was buried as deeply as the tulip bulbs in my front yard. Though I continued to look, finding beauty in snow was becoming increasingly difficult. Thankfully, the days following Xanto turned more seasonable. Plenty of sunshine and temperatures reaching into the 60s melted most of the snow within a week. Now that was something I could wax poetic about. April 16: Bright spring sun tunes rooflines, gutters, and rainspouts into a musical panorama of drip-drop plink-plop babbling brooks. Still feeling bruised and battered by the winter, though, I half expected another blizzard to creep into the forecast. Finally, at the end of April we had a stretch of several overnight lows above freezing, and leaf buds began to unfurl. Maybe spring had truly arrived at last. I yearned to immerse myself in re-awakening life, hear chickadees sing “Phoe-be,” see a thousand shades of green, and feel a warm breeze on my face. As if I needed any additional prompting to spend a sun-drenched day outside, the Parks Department’s Citywide Spring Cleanup and the iNaturalist City Nature Challenge were both happening on the last Sunday of April. My daughters and I spent the morning at our neighborhood park, gloves on and trash bags in hand. Our eyes were mostly on the ground, scanning for litter. Tuned in to anything that wasn’t green, gray, or brown, my seven-year-old spotted a brightly colored rock tucked into a hollow in a tree. 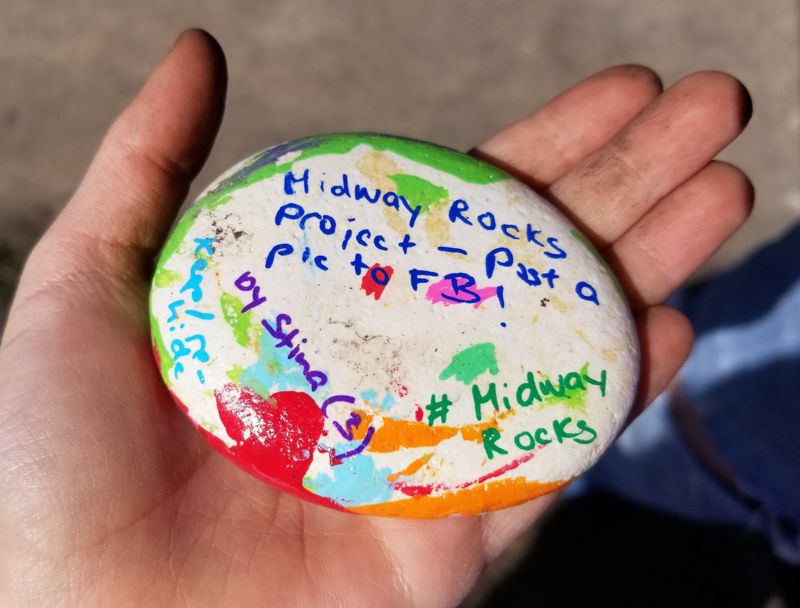 Pulling it out, we found it bore a note, “Midway Rocks Project,” and was apparently decorated by a child named Stina, age 3, whose name was inscribed in purple. The colorful rock was just the kind of delightful find I’d been missing after a long winter. I also loved the message it conveyed: that my neighbors, too, were finding their way back to the park and were eager to share their sense of wonder with the community. That afternoon, I wanted to get to one of the larger regional parks where we might have a better chance of spotting some interesting critters for the City Nature Challenge. While the girls played on the playground, I happened to catch a glimpse of something glinting overhead. Looking up, I saw a flock of a couple dozen large water birds. Like cut and polished jewels in a treasure chest, white birds flash, bright on bright, as they soar through a sun-filled sky. I am just beginning to weave attempts at bird identification into my natural history observations, and, at such a distance, I couldn’t determine what I was seeing. Watching in wonder as they flew over the park, I tried to spot potentially helpful characteristics and snap a few photos. Aiming my phone’s camera at distant moving objects against the bright blue glare of a clear sky, I wasn’t sure I’d even managed to get them in the frame. I looked at the photos later that evening, and they initially seemed to hold nothing but blue sky. Then I noticed a cluster of tiny specks in one of the shots. Zooming in, I realized I could make out the birds, and even their mostly stark white bodies with black bands on the wings. With no better guesses as to what they might be, I Googled, “heron identification.” I was soon poking around on the Cornell Lab of Ornithology website. I found Great Egrets and Snowy Egrets, both white, but without any black on their wings. Wood Storks have black on their wings, but live in only a few pockets in the Deep South. Continuing through the similar species suggestions, I stumbled upon Whooping Cranes. Whooping Cranes are large and white, with “black wingtips only visible in flight.” They winter in Texas and breed in Canada, potentially putting Minnesota on their migration route. It seemed highly unlikely that I had actually spotted a large flock of Whooping Cranes, but I hadn’t found anything else that fit what I had seen. I sent an email with the grainy zoomed in portions of my photos to a couple of friends who are better birders than me and went to bed wondering if I’d witnessed something truly spectacular. When the replies came back the next morning, both suggested the eminently more reasonable American White Pelican. Back on the Cornell Lab website, I looked up American White Pelican, which somehow had not come up the night before. 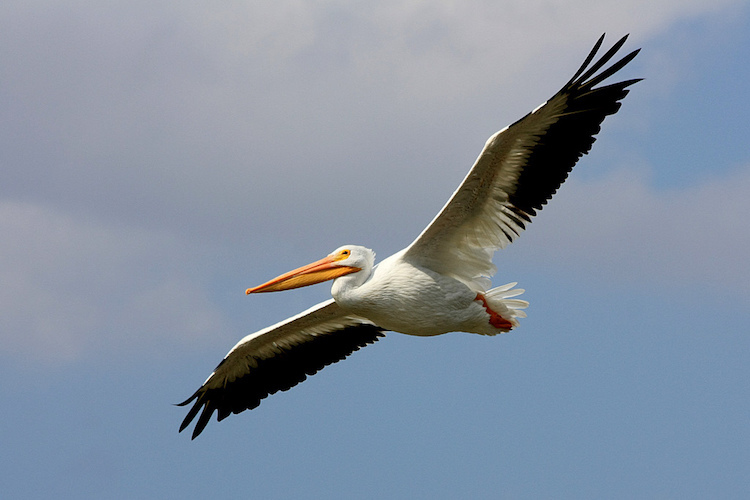 Sure enough, pelicans are large white water birds with black bands on their wings that definitely migrate through Minnesota and often congregate in large flocks. 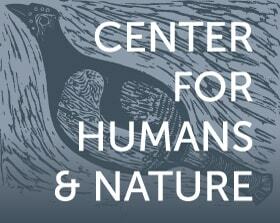 While not quite as awesome as endangered Whooping Cranes, it was rewarding to have a positive identification. 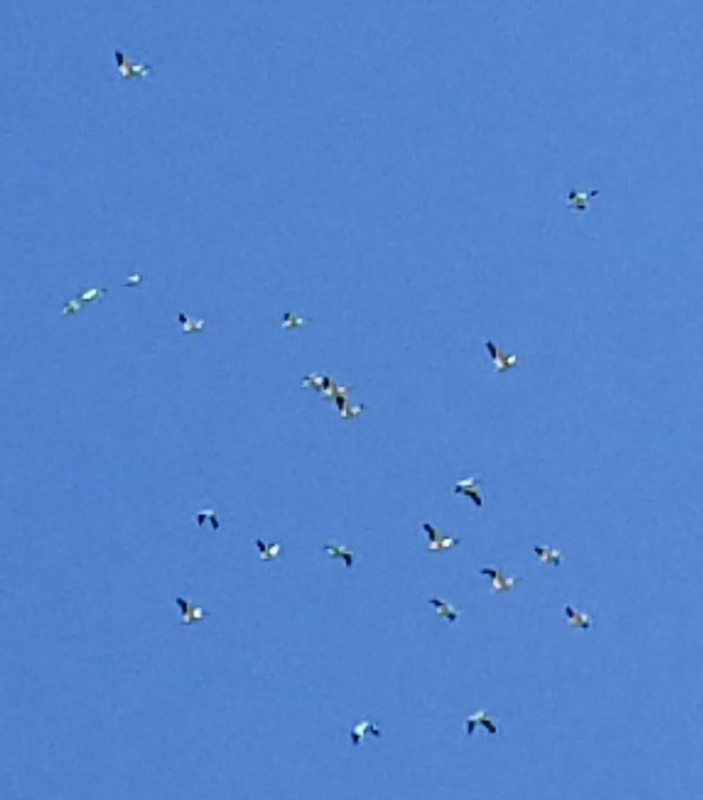 And the somewhat more pedestrian nature of the species took nothing away from the majesty of their soaring flight. An Ohio buckeye’s multitude of clenched fists slowly uncurl, tender fingers reaching out to taste the warm spring rain. Like those tiny leaves, I felt that I too was finally able to uncurl and once again open my fingers, eyes, and ears to the wonders around me. So far, I haven’t actually spotted any Whooping Cranes. As I continue to practice attentiveness and openness, however, I do—almost always—find something at least as delightful as a flock of American White Pelicans, a friendly rock painted by a neighbor, or something as seemingly ordinary as sunlight on a leaf. June 23, 2017: A maple leaf catches early morning sun in its green net, holding the light up to be admired. Tracy Kugler is a geographer in St. Paul, Minnesota. By day, she wrangles data as a researcher with IPUMS, at the University of Minnesota. By night, she wrangles children and words. She is working on her first book, Moments in the Park: A Mindful Journey through St. Paul, Minnesota.